Crucifixion thorn is an intricately branched, spiny shrub or small tree which has no leaves -- just thick, rigid, sharp branches, which perform photosynthesis. 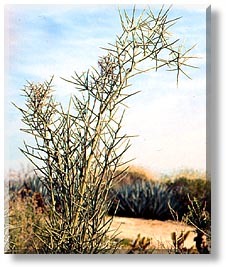 The crucifixion thorn is bluish gray-green in color and can grow up to 10 feet tall. Young branches are covered with very short, fine hairs; older branches are streaked with gray-brown bark. The very sharp thorns at the ends of branches are either lighter or darker than the stems. There are two other desert plants that are sometimes called crucifixion thorn, but botanists usually reserve the name for this member of the Quassia family (Simaroubaceae). This plant is sometimes called holocantha or corona de Cristo as well. Another species, Castela texana, grows in the Chihuahuan Desert south of El Paso, Texas and into Mexico. Sonoran Desert of far southwestern Arizona and far southeastern California, south into Baja California and Sonora, Mexico. Dry, rocky desert washes, slopes and plains from 500 to 2,000 feet. Reddish-brown, 5-petaled flowers less than 1/2 inch wide bloom in the spring and early summer. Clusters of reddish-brown seeds about 1/2 inch long hang down in groups of 5. Seeds may persist for several years.